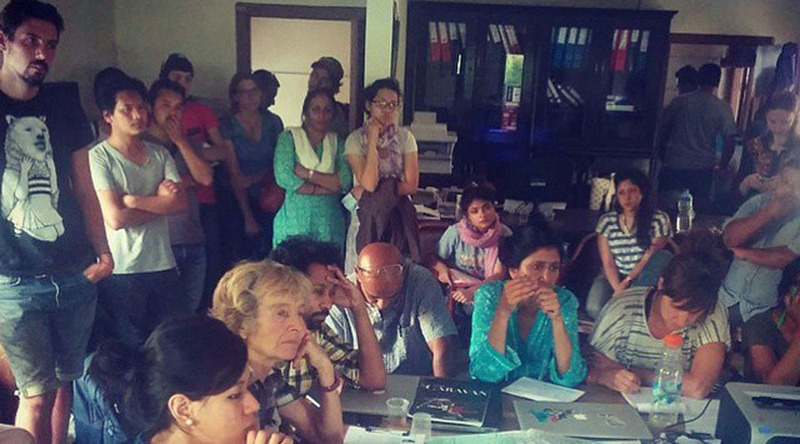 At 11:56 on 25 April 2015, Nayantara Gurung Kakshapati, a Nepalese photographer, was halfway through the last day of an oral history workshop in downtown Kathmandu when the ground started shaking. Within minutes of escaping from the building, she and some friends saw clouds of dust rising from the city. They were coming from the old town in the capital’s sister city Patan. She decided to see how she could help. Thousands of miles away, Maia Ruth Lee, a Korean friend Gurung Kakshapati had known since they were both children growing up in Kathmandu, was fast asleep in her apartment in New York. Four hours later, she woke to a slew of panicked texts and emails. This kind of hyperlocal philanthropy hasn't been possible before... We are at the tip of the iceberg of personal fundraising. Lee is one of a new breed of disaster fundraisers who are leveraging personal networks via social media to raise and channel money directly to people in need on the ground. A scan of online fundraising platforms reveals hundreds of similar pages. There are Nepalis overseas raising funds for their village, climbers supporting Sherpa families, trekkers campaigning for communities they spent time with on holiday, and Nepalese doctors looking for support for their clinics and hospitals. And the money is flooding in. Indiegogo Life, a platform launched only six months ago specifically for personal fundraising, says 750 people have started individual appeals for Nepal raising $2.5 million so far. “It’s been our biggest single appeal to date,” says head of Indiegogo Life, Breanna DiGiammarino. Another online fundraising platform, Global Giving, has recorded nearly $4 million raised to date. This is in line with the overall explosion in crowdfunding globally, an industry that grew in value from $1.5 billion in 2011 to $16.2 billion in 2014, according to industry research firm Massolution, with a further doubling projected in 2015. Why are personal online appeals proving so popular? One factor, says Alison Carlman of Global Giving, is increasing disillusionment with major NGOs, which were seen to waste money during the response to a 2010 earthquake in Haiti. These platforms are also revolutionising fundraising for local organisations, enabling them to appeal directly for support from the giving public instead of waiting for an international organisation to make a grant. Setting up an appeal requires only a bank account, an internet connection and a few minutes. And the money can be provided extremely fast: Lee’s fundraiser, launched on 27 April, had raised thousands of dollars by 28 April, and the first tranche of money was in Nepal by 30 April, just five days after the quake. 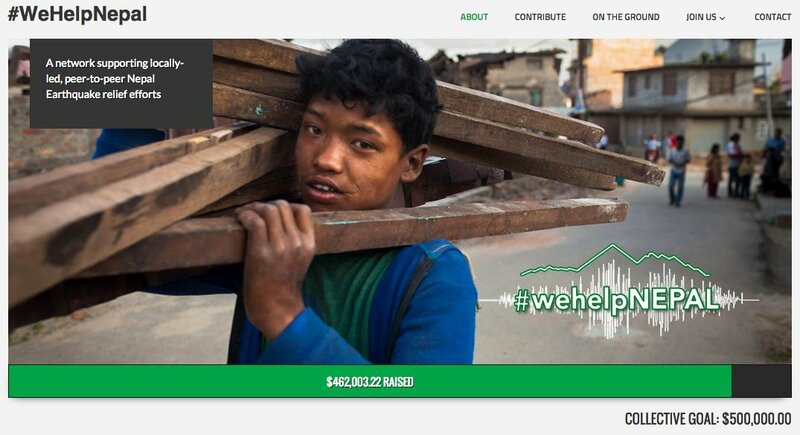 Among the Nepalese organisations to have set up online appeals are Kathmandu Living Labs ($10,000 to date via Indiegogo), the American Nepal Medical Foundation ($468,323 also via Indiegogo) and the #WeHelpNepal platform, a network supporting local peer-to-peer Nepal-based earthquake response efforts, which has so far raised $462,000. Global Giving alone has recorded 70 projects posted as appeals by responding organisations. Le réseau #WeHelpNepal a récolté plus de 462 000 dollars. But online platforms can also pose risks. Last year, GiveDirectly, a new online platform using a slightly different model – it sells itself as giving donors a direct link to “the extreme poor” – had donations stolen when a local employee colluded with others to skim money from what recipients were meant to receive. But for the Future of Humanitarian Funding (FHF), an initiative looking for innovative approaches to financing emergency aid delivery, these kinds of platforms are no more open to fraud than other kinds of fundraising, including via SMS or donations to major international organisations. In fact, they could well create new ways to tackle transparency. For example, the Yellow House, the organisation Gurung Kakshapati set up, started a Google Doc – updated daily to show all its spending – and emailed it to all those who donated. “On a very simple level we felt accountable – these were individuals who were giving money, trusting us,” says Gurung Kakshapati. On her page, Lee posted frequent updates and pictures of the operation on the ground, including a report of a visit her mother paid to the Yellow House. Global Giving offers a guarantee to all donors: “If you are unhappy with the way your funds are used – if, for example, you donated money for a school and the organisation decided to build a well instead – we will refund your donation up to $10,000 as a voucher,” says Carlman. “You can then redirect that funding to something that suits you better.” Because of the potential for scams and misuse of funding, Global Giving vets all the organisations on its platform. The influence of online fundraisers at present should not be overstated: The money raised via online platforms for Nepal is still dwarfed by the fundraising efforts of major organisations. Nor are online platforms overhead-free: they are businesses, and take a cut of donations raised. Global Giving USA, for example, levies 15 percent: two percent goes to Global Giving, three percent to the credit card companies and 10 percent to vetting and supporting organisations (donors have an option to pay these themselves ensuring their entire original donation goes to their chosen organisation). Indiegogo Life is currently fee-free, but parent site Indiegogo charges a nine percent fee on funds raised, which drops to four percent for organisations that meet their fundraising target. And crowdfunding risks replicating existing problems in more traditional aid financing, FHF points out. For example, high-profile natural disasters are likely to attract more attention and money than the chronic crises that form most of the humanitarian caseload. Une réunion de bénévoles de Yellow House.